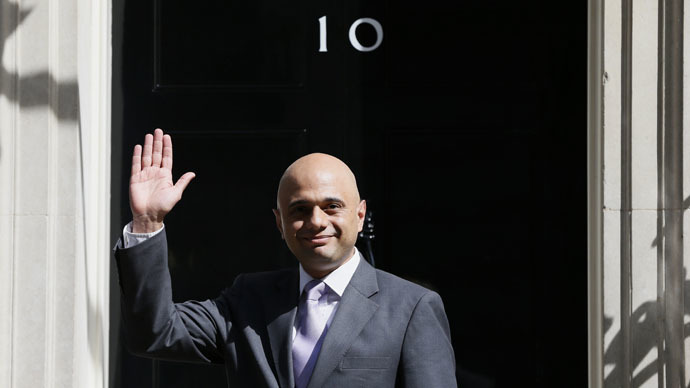 Newly promoted Tory Business Secretary Sajid Javid has unveiled plans to make it more difficult for trade unionists to take strike action. The measures will be introduced in the government’s first Queen’s Speech. The legislation is designed to ensure strikes cannot go ahead unless they have the support of 40 percent of balloted members. In addition to the vote share, at least 50 percent of those eligible to vote must cast their ballot for the result to be considered legitimate. Javid told the BBC he would prioritize measures which would allow employers to hire agency staff – known in the labor movement as ‘scabs’ – to replace workers taking strike action. “We have already made clear in terms of strike laws that there will be some significant changes,” he said. “We've said that there will be a minimum threshold in terms of turnout of 50 percent of those entitled to vote. “We have also said that when it comes to essential public services, at least 40 percent of people need to vote for strike action. And we’ve said we’re going to lift the ban on the use of agency staff when strike action takes place. “That's something we’ll give more detail on in the Queen's Speech but it will be a priority. We need to update our strike laws and we’ve never hidden away from the changes we want to make,” he added. The plans have sparked outrage among trade unionists. “David Cameron’s incoming Conservative government, elected by just over 24 percent of the electorate, wouldn’t even be in Downing Street if the same laws were applied to them. The calculation of the Tory government is that they can effectively outlaw strikes in the public sector. “However they may well be over-reaching themselves in the euphoria of their narrow victory. The root causes of industrial action, low pay, bullying at work, long hours etc, cannot be wished away by an act of Parliament. The consequence of this proposal will be widespread anger and the Socialist Party will be campaigning energetically for action to defend the right to strike,” she added. “Those who want their staff to be on zero-hours contracts, poverty pay and unable to effectively organize in a union so that they can do something about it. “The government’s proposals on union ballots will make legal strikes close to impossible. Union negotiators will be left with no more power than Oliver Twist when he asked for more. “After five years of falling living standards the prospects for decent pay rises have just got a whole lot worse,” she said. The new measures come just hours after the announcement of the new cabinet, and coincide with a strike vote from the Rail, Maritime and Transport (RMT) union, which could announce industrial action on the Docklands Light Railway. RMT General Secretary Mick Cash said: “It was on the cards that this government, a wholly-owned subsidiary of the idle rich and the bad bosses, would move quickly to tighten the noose of the anti-union laws around the workers’ necks at the earliest opportunity.